A tear, even a small one, can visually ruin a comforter. You might think that buying a new one is the easiest solution, but it can take less time to fix a torn comforter than to shop around for another one that you like. One of several relatively simple methods to fix a torn comforter is likely to fit your skill level -- and can possibly result in a new look for your bedding. Multi-colored comforters hide repairs well. 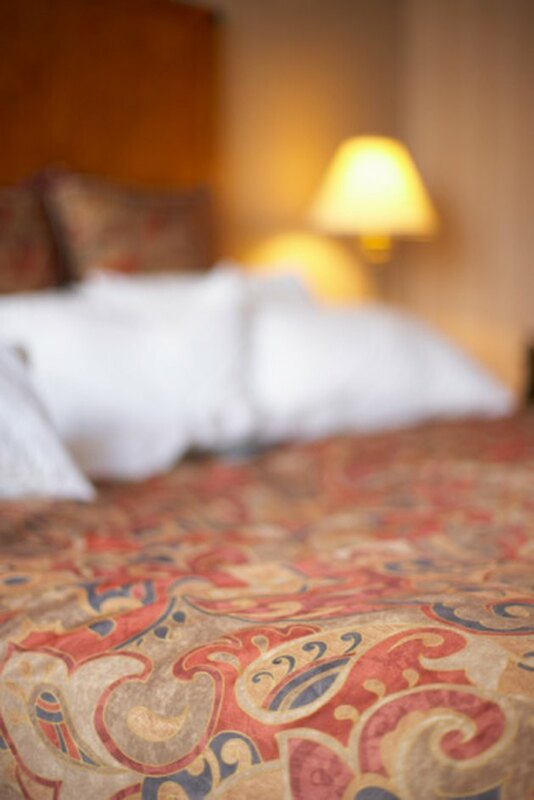 Mending is one of the most common methods to fix a tear in a comforter. By sewing the torn edges together with like-colored thread and small, neat slip-stitches, the hole is barely visible, similar to a scar. Tuck or turn under only enough of each torn edge to conceal the tear's fray or roughness. Align the folded fabric evenly together, and lift it up just enough to keep the stitches from catching the comforter filling or innards, while you sew. If you lack sewing skill, fabric glue can replace needle and thread. Fabric glue allows you to fix fabrics by placing the torn areas together and gluing them. The comforter cover's looseness should allow you to overlap the tear's edges slightly, but if not, tuck a piece of lightweight cotton under the tear on which to glue the edges back together. The tears joined edges leave only a faint "scar," but the material may pucker in the area. A fabric patch can cover a small torn spot or hole in your comforter. An iron-on or glue-on patch is easier to apply than one that requires sewing. Iron-on patches come in a variety of colors. Pick one that is similar in color and texture to your comforter, so that the tear is not noticeable. Alternatively, apply numerous patches in contrasting or complementary colors for an overall polka-dot effect. Launder the comforter before applying an iron-on patch, so that the patch adheres properly. Appliques offer a way to hide a tear. Some appliques come ready to iron on, while others may require sewing or glue to attach. They may be embroidered butterflies, flowers, birds or a variety of other available designs. You can relatively easily achieve a custom look by applying your own appliques, using lengths of trim to camouflage a long or winding tear, or fabric remnants, such as lace or an unused embroidered tablecloth. Apply appliques in a pattern across the tear area, from one side of the comforter to the other for an interesting new look. The easiest temporary "fix" or solution for a tear in the comforter's top is to flip over the comforter. Often the back side is in the dominant color from the front, and some comforters are double-sided. Until you get around to mending or covering your comforter's tear, at least you won't have to look at it. How Do I Fix a Couch That My Dog Tore Up?